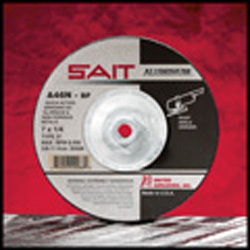 Sait Aluminum A46N are United Abrasives grinding wheels providing quick action on aluminum & non-ferrous metals and claim to outlast the competition by as much as 40%. They are made of aluminum oxide, a medium grain size and a soft bond for aggressive stock removal without loading. Applications: Non-Ferrous Metals such as aluminum, copper and brass. 4 1/2" diameter, 1/4" thick, Type 27 (depressed center), 7/8" bore, no hub. For right angle grinders.